Your mother was right about having something nice to say. Especially if your clients are businesses. I am waiting. Right now. But I am OK. I guess until I get the bill. But I’m still OK.
My water heater has been leaking for three days and of course two of those days are over the weekend. At first I thought some weird condensation thing was happening given the freezing temperatures and then I was hoping it might be some pressure valve temporary issue where it needed to vent a little bit of water on the floor and that would be that. That video of a Colorado plumber explaining things (and I have no idea why some Colorado local plumber’s video was at the top of the search page given Google knows exactly where I am searching from in Massachusetts) taught me to consider condensation and to check and see (by putting small bucket under the pressure valve tube) if the pressure valve was the culprit. They weren’t – that meant the worst scenario; an actual breach to the water heater. Here’s where some things don’t change but probably could have. Armed with new knowledge and not feeling like a complete idiot, yet sadly realizing this cool expert plumber guy was a couple of thousand miles away, I called someone else. I called the company that fixed my furnace last year and the air conditioning thing a ma jig. I called them and asked them to recommend a plumbing company to help with my water heater issue. They gave me a name. Done. That company is on their way. Referrals from trusted people or suppliers are killer. That will never get old. 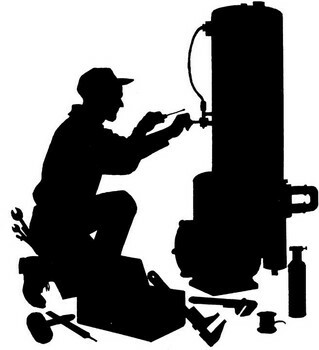 I will tell you though, if that video in water heaters was a local guy, a local company – I would of straight up called him first as the video was done so well done; professional yet personal, homey yet really informative. So recognize this all you businesses or salespeople or experts in any field – get some quality video out to help educate your prospects and customers. Get it out in such a way that you drive it to the top of search engines using everything you got in great content and SEO. Because getting smart is what we all do now as the first step before we open our wallets. It’s always a risk to see my mug on video first thing in the morning – but here are two short ones to jump start your day with messages about planning. The first one can help you like, today.. So we decided to have contest among Learning & Development pros here focused on making a short, entertaining training video that sticks. So um… I though I would give it a go. What do you get when you get mix One minute of video, Halloween, an important business message and bad acting? This sad ( but funny – I think) video. Enjoy. This movie was created with iMovie, an iOS application created by Apple. I do not own any rights to this video. Sound effects, and graphics were provided by iMovie and iTunes. The recorded video is of family, friends and myself.